This table seats up to 10 people (four on each side, one on each end). It measures 8′ x 30″ x 30″ and is wood topped. We carry a wide assortment of linens for this table, including standard 60″x120″ banquet in a rainbow of colors or 90″x156″ banquet floor length in black or white. SKU: PGA02. Categories: Party & Event, Tables, Chairs, & Tents, Tables. Tags: banquet, oblong, picnic, rectangular, table. This banquet table seats up to 10 people (four on each side, one on each end). It measures 8′ x 30″ x 30″ and is wood topped. 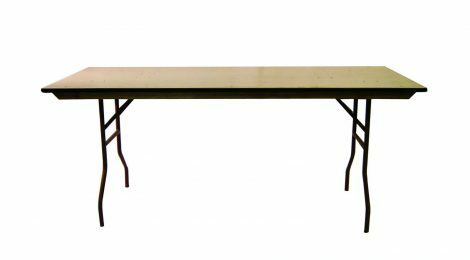 We carry a wide assortment of linens for this table, including standard 60″x120″ banquet in a rainbow of colors or 90″x156″ banquet floor length in black or white. This table seats 8 people comfortably. It measures 5′ across x 30″ tall and is wood topped. We carry a wide assortment of linens for this table, including standard 90″ round in a rainbow of colors or 118″ round floor length in white, black, or ivory. 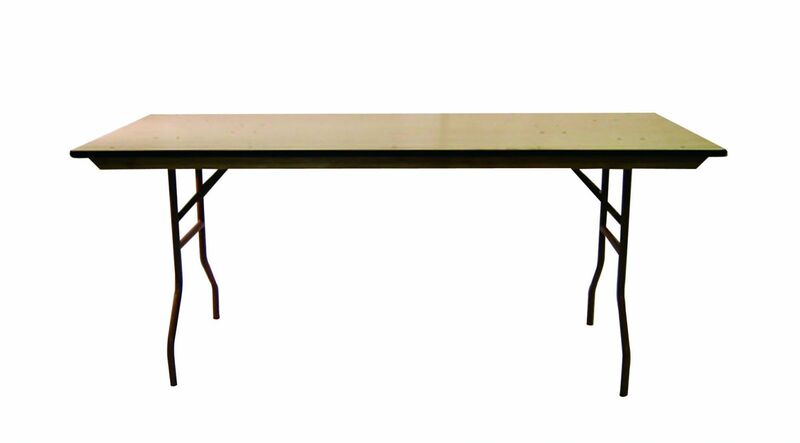 This table seats up to 4 people on one side and is meant to be used as a classroom style table. It measures 8′ x 18″ x 30″ and has a smooth surface for writing or note taking. We carry linens for this table which are standard 60″x120″ banquet in a rainbow of colors.